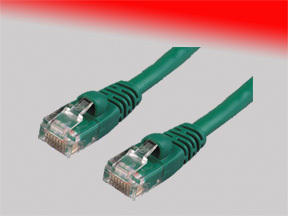 Enhanced Cat 5 Cables are used in structured cabling for computer networks such as Ethernet, although it is also used to carry many other signals such as basic voice services, token ring, and ATM (at up to 155 Mbit/s, over short distances). Cat5 enhanced cables are designed to allocate video, voice, and data. These cables transport high performance at 350MHZ. Our CAT5E cables use a 24AWG stranded cable and consist of 4 unshielded twisted pairs (UTP) with RJ45 plugs. The cable’s molded boots provide strain relief for the cable also aiding in easier installation.